A great battle of Poland will be waged within the confines of New York City when UFC 205 rolls around on November 12. An area with a large Polish-American community will only add to the layers of history that the event withholds, as the organization's smallest division looms large at Madison Square Garden. Joanna Jędrzejczyk, holder of the second longest active UFC title reign, will look to add fellow countrywoman Karolina Kowalkiewicz in one of three title fights on a mouthwatering main card. It's more than just a "bonus" addition with spelling and pronunciation challenges for broadcasters and journalists, though. The reigning strawweight champion has brutally ruled over the 115 lbs, with her vicious striking slicing up all comers, setting a furious pace which overwhelms and eventually folds the opposition. She will look to add the undefeated Kowalkiewicz to the list of victims, a fighter who doesn't exactly devastate her opponents, but applies enough pressure to get the rounds won and the job done. They met over four years ago way back in the amateurs, and now, on the first ever all-European UFC championship bout, they will square off again with the most prestigious of gold belts up for grabs. So who walks away with the strawweight strap at UFC 205? We delve into the fight and the fighters involved in the first of our UFC 205 breakdown series. Joanna Jędrzejczyk has cultivated a reputation for ruthless, merciless beatdowns inside the cage having completed a successful transition from kickboxing and Muay Thai - where she was a world champion - to mixed martial arts. 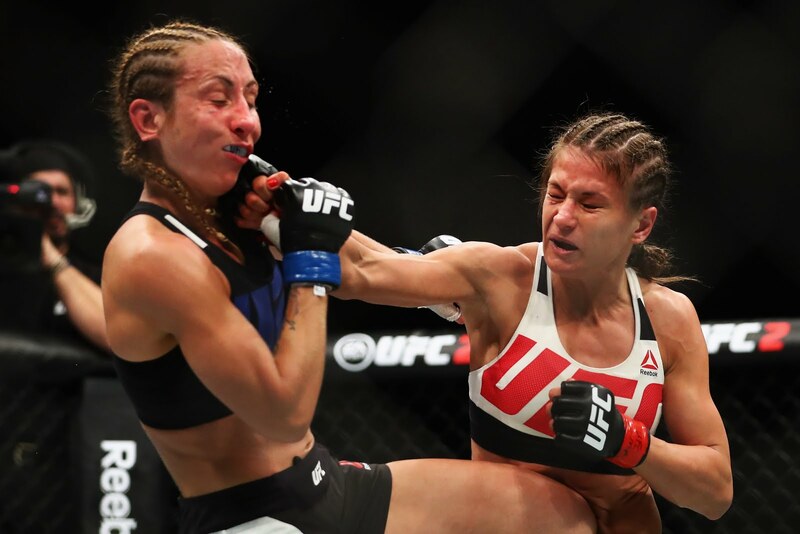 At UFC 185, the Pole obliterated Carla Esparza in two rounds to begin her title reign, and ended up lasting 8 other champions to preserve a reign that stands strong today, fresh off a powerful comeback victory against Cláudia Gadelha. 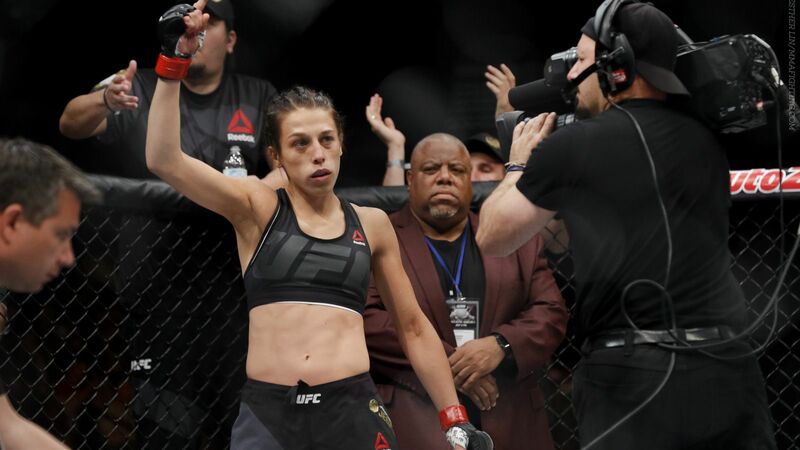 In that fight, Joanna certainly proved deserving of the "champion" tag, overpowering her Brazilian foe after getting knocked down early and then surviving being out-wrestled on the canvas for the first two frames. She would go on to construct a striking clinic which tore apart the South American and gave her the unanimous decision nod. Joanna is vicious, and it doesn't just arise from her decorated striking inside the cage. A scandalous reputation of getting into her opponents' heads before the fight has been prolonged as she has been quick to let the insults fly against her compatriot. Mental warfare in mixed martial arts is becoming more prominent by the day, with the vast increase of exposure and press events, and with the need for promotion at its highest, the strawweight sovereign has plenty of opportunities to infiltrate into the minds of her fellow combatants. A world championship career in Muay Thai has translated excellently into brutal striking in the cage, and that is the basis of her game. Takedown defence has bloomed over the title reign, allowing her to mix up elbows that have the effect of lightweights if not more, along with crisp boxing, body kicks and knees. Many challengers have been fooled into thinking that, just because Joanna has elite striking, her wrestling will be a weak point. Even if Cláudia Gadelha was able to equip the correct tools for the first two rounds of their rematch, she faded, not having enough in the tank to deny the sprawls of the Pole. Ahead of the first ever all-European championship fight in UFC history, JJ moved camps to the juggernauts that are American Top Team. Mike Brown has taken the reins of her training as part of a facility which also is home to bantamweight champion Amanda Nunes, with the move from a small camp to a massive team allowing her to sharpen the tools even more. However, it may also possess some mystery to it. 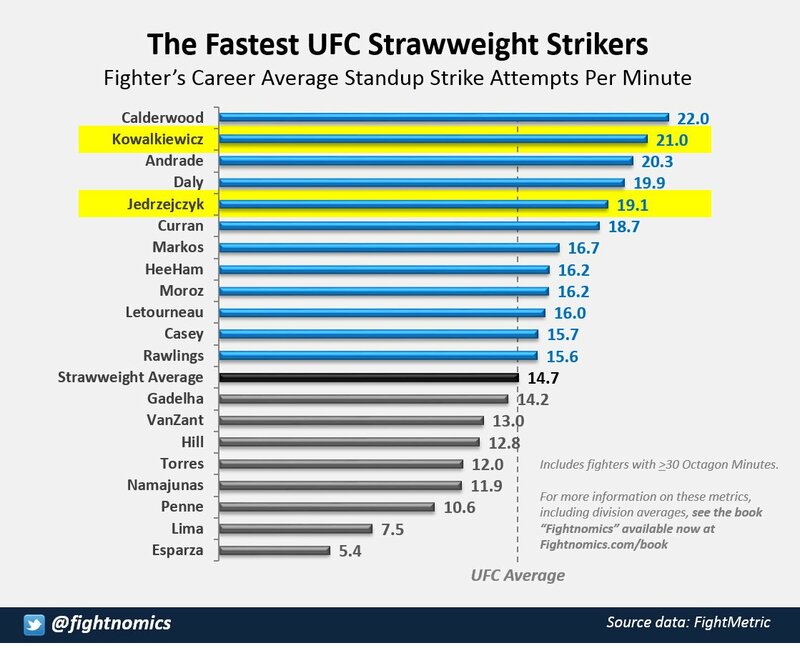 Fighters and coaches can't just forge connections overnight - at least not all of them - so perhaps Kowalkiewicz can clutch on to that as some extra fuel, although considering how good Jędrzejczyk was before the move, any improvements now spell massive danger. Three out of three wins by decision has awarded the undefeated Karolina Kowalkiewicz a title shot less than a year into her stint in the UFC. Most recently, she knocked off top contender Rose Namajunas in a competitive co-main event at UFC 201, with her style convincing to judges but not as threatening as her Madison Square Garden dance partner. She applies plenty of footwork, moving from side to side and cautiously in and out to begin exchanges, although is unable to achieve much in the early minutes. A lot of success has been found through the clinch, especially up against the fence, where she can pop some knee strikes in and wear down opposition. Kowalkiewicz eked out a split decision to secure the title shot back in July, and a lot of her game was further revaled then against truly stern opposition. A tendency to keep the hands down could be deterimental, although it appears she still has a lot of evolving to do and room for improvement, some of which can be triggered in a high stakes situation at UFC 205. The striking credentials and quality really emerge later in the fight, when the clinching has worn the opponents down to making them vulnerable on the stand-up. It also means she doesn't have to worry too much about takedowns in that area, really able to let loose. Perhaps she could have had a few more fights before the title fight, but then again she proved she deserved it in 3 attempts. Neither Jędrzejczyk or Kowalkiewicz are too concerned about getting the fight to the mat and scoring with takedowns. That should mean mostly good things for fight fans come their strawweight championship tilt. It doesn't take too much filing through the internet to realise Jędrzejczyk is the better striker. On credentials alone, being a Muay Thai champion with a plethora of kickboxing fights on her resume will give her the edge on a fundamental basis. We'll be getting plenty of volume, which will make for an entertaining fight - this could just be a slugfest. 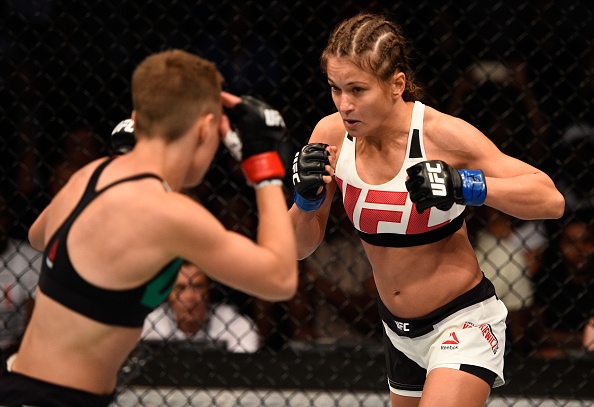 However, Kowalkiewicz may offer something different than previous opponents. As alluded to earlier, she does use a lot of footwork, and if she can push it to the later rounds the penny may drop. The only problem is, she's been hit by Namajunas and other opponents, proving to be rather hittable. That's a serious issue that needs fixing to find any success against the champion. 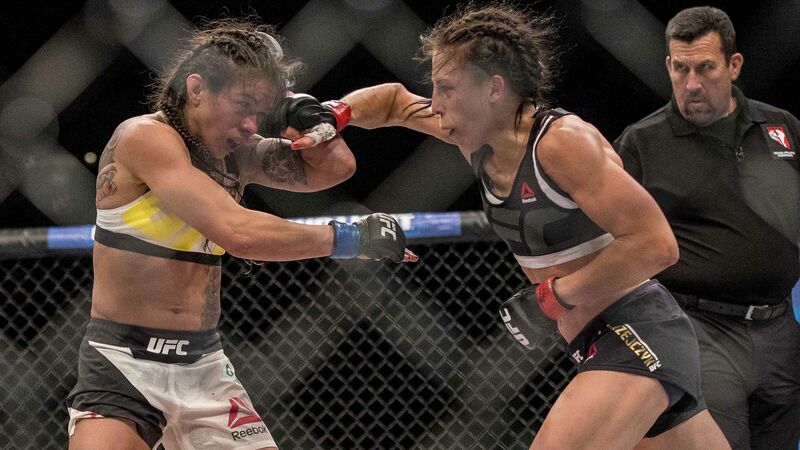 What Jędrzejczyk may also look to capitalise on is the head movement when the challenger sits down on the punches. It's somewhat of a lunge, with her head dipping right in the firing line - and if that's exploited then momentum may only gather in favour of the red corner. However, it comes with a big reward, if she lands with that somewhat moderated overhand, she could clip and endanger Jędrzejczyk - but it hasn't finished any UFC calibre women so far so the jury is still out on that one. Joanna Jędrzejczyk demonstrated her improved takedown defence with a fantastic series of sprawls against Gadelha in one of three fight nights on UFC 200 week. The Brazilian had more success than most due to her physical strength and specialities, but since Kowalkiewicz hasn't stressed the need for that in her first three fights, she'll be on a level playing field if not lower from a grappling standpoint. A concept of "anti-wrestling" has been discussed by some analysts, and it means that Jędrzejczyk may keep things in her comfort zone - and her opponent's - on the night. Vanquished foes of both fighters have learnt many valuable lessons after their defeats, but perhaps none more prominent than what to do in the clinch. If you've been spectating on the pre-event buzz on social media, the chances are you would have stumbled across video footage of some devastating elbows from Jędrzejczyk. In the clinch, they could very well finish the fight. Again it goes back to the Muay Thai background, as Joanna applies pressure and tugs down on the head to unleash her wrath, it's textbook stuff. Kowalkiewicz seems to have picked up on some of those skills too, with knees to the body arguably her biggest chance of a massive gut check - one which could crown her strawweight champion. After some explosive exchanges on the feet, the bets are off for how much time these two will spend pressed up against the fence. Jędrzejczyk has proven her assets to be able to weather a storm of pressure and come back with full force, while Kowalkiewicz has experienced some adversity against Clark and Namajunas, but still having not been equipped yet for a five round championship fight, things could pan out very differently. It's a massive gamble if Kowalkiewicz does decide to initiate the clinch though. If the knees land, then the complexion of the fight could change, but the elite skills of the champion mean one wrong tie up, one shoulder out of place or not getting the hooks could leave Karolina all sorts of busted up. 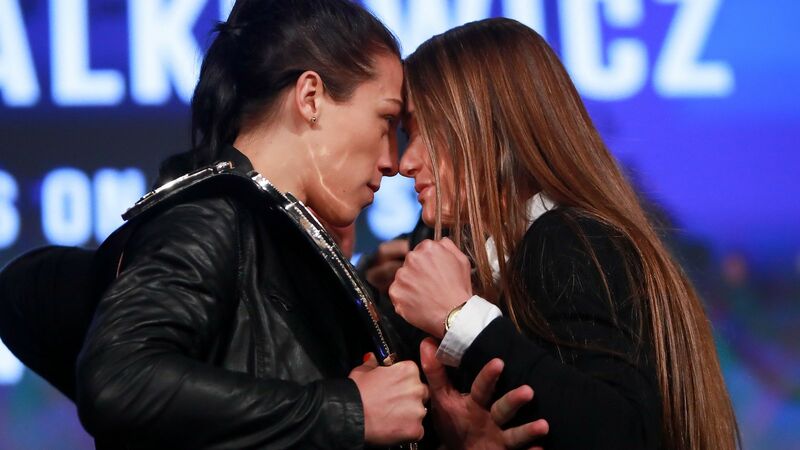 Dependant on how the fight goes, though, if Kowalkiewicz realises her chances of catching the strawweight throne holder are slim on the feet, she may just look to back her opponent up and pop a few knees in, they will take its toll and allow the slow-burning style to build effect and a potential lead over the five rounds. This fight will perhaps hinge on the one asset in its duration. Kowalkiewicz's clinch game is the biggest threat she brings to the table, but the champion has also built a reputation for demolishing people in that space. If Karolina can prove the better fighter in that area over the early moments, she knows where to go, but should she struggle to assert her dominance, Jędrzejczyk can exploit the advantage then opt to the field where she really excels - back in striking range. Let's not forget, this is scheduled for five rounds. Experience could define the tale come fight night. Joanna Jędrzejczyk is training for her fifth consecutive five round title fight, having went the whole 25 minutes in her last 2 bouts. This will be the first time where the challenger will prepare for a five-round fight. In some ways, a longer fight may allow Kowalkiewicz to get into a true rhythm and really take the fight convincingly. She starts slow, but then grows into the fight and begins to tee off on opponents. If you were to add two more rounds to the 3 she has fought in all of her UFC fights so far, it would have been lopsided if not a finish. But now she is in their with the meanest of the bunch, she's fighting the best strawweight in the world. Joanna Jędrzejczyk outlasted Gadelha, tore apart Letourneau and just continued to find new winds as she progressed. Karolina can't hope to outrun her, because the only way to do that would be to hold her down - and that didn't work for the previous challenger. If you're clutching at straws you could compare the differences in altitude between Poland and Florida, but it's nothing extreme. Jędrzejczyk will be able to go much faster than she is, but it could make for a furious latter half of the fight. Everything points towards a Joanna Jędrzejczyk victory, and quite comfortably. Her excellent striking is on a calibre matched by very few, meaning that Karolina Kowalkiewicz's similar style may not be up to scratch. There are X-factors though, with how the champion will be like after changing camps and how the challenger could rise to the occasion over five rounds. Kowalkiewicz's hope lies in the clinch, but that has a slim chance of working out. Nonetheless, she is tough, durable and undefeated, capable of taking it to the judges scorecards but nothing beyond that of a defeat.